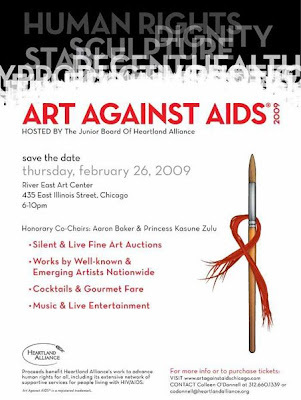 I will be participating in Heartland Alliance’s Art Against AIDS exhibition, held at the River East Art Center on Thursday, February 26th, 2009. An evening of food, fun, and fine art! Bring health, hope, and opportunity to the frontlines of an epidemic. Please visit: Art Against AIDS for further information and to purchase tickets. Very nice initiative ! Bravo.